1938 Packard Other in Orange Village, OH for sale. 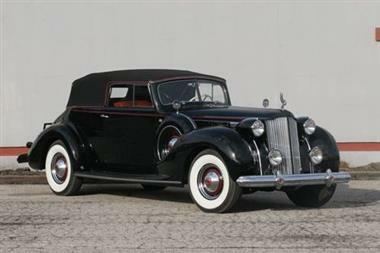 andbull; Sold new by Packard of Manhattan May 22, 1938<br />andbull; Classic Car Club of America Senior winner<br />andbull; One of only 157 Packard V-12s in 1938 and one of the rarest body styles<br />andbull; V-12 power<br /><br />Packards 424-cubic inch V-12 engine, the Twin Six, made the companys fortune when it was introduced in 1916. It was discontinued in 1923 due to cost concerns, leaving the company to concentrate on six- and eight-cylinder motors for the remainder of the 1920s.<br /><br />The resurgence of multi-cylinder fever in the early 1930s brought enormous V-12s and V-16s from Cadillac, Marmon, Pierce-Arrow and Lincoln, prompting Packard to reintroduce a 445.5-cubic inch, 160 hp V-12 in 1932. Generating almost double the horsepower of the old V-12, it was billed as the Twin Six for the first year and then became famous as The Twelve. 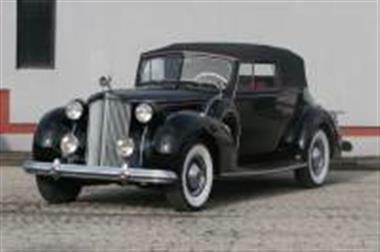 It was built until 1939 and was perhaps the finest American car of the decade.<br /><br />Designed by C.W. van Ranst, who had worked for Harry Miller and E.L. Cord, the engine boasted 322 foot-pounds of torque and could propel enormous coachbuilt sedans and limousines to 60 mph in 20 seconds. 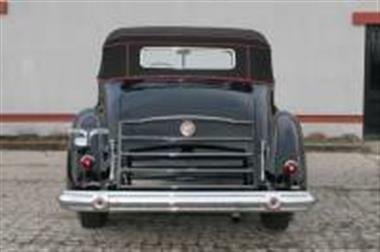 One was timed at 101 mph, but Packard only claimed in excess of 85 mph.<br /><br />The 67-degree engine was a modified L configuration with valve stems almost horizontal and operated by a camshaft deep in the engines heads through roller rockers on hydraulically adjusted eccentrics. The result was almost completely silent. 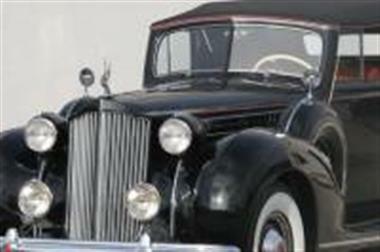 In 1935 aluminum heads and a longer stroke boosted the engine displacement to 473 cubic inches and the horsepower to 175, putting a genuine 100 mph in reach.<br /><br />Most bodies emanated from LeBaron and the Murray Body Corporation, but while Edward Macauley headed Packards in-house styling department, along with Alex de Sakhnoffsky, Raymond Dietrich was the most influential figure. However by 1937 Dietrich had gone, and the custom bodywork was shared between Brunn and Rollston. The senior-series cars were updated with fourandshy;-wheel hydraulic brakes and independent front suspension, in common with their junior siblings.<br /><br />The car offered here is a five-place Victoria, a body style named after a horse-andshy;drawn carriage, which featured fitted side-windows and an expansive blind C-pillar. 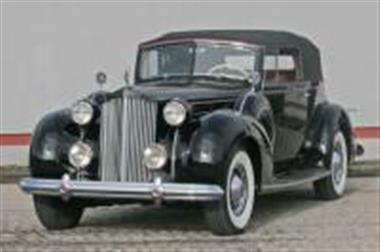 Preferred by owner-drivers, the Victoria could be buttoned up tight in inclement weather, or the top could be lowered into a well behind the doors, for a sleek open look when the sun came out.<br /><br />This car was sold new by Packard of Manhattan in New York City. 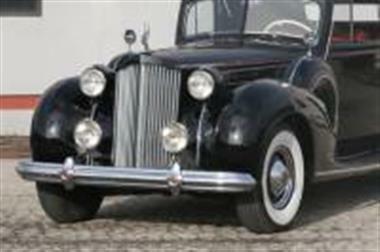 It was painstakingly restored a number of years ago and won a Classic Car of America Senior First Place Trophy #1609. 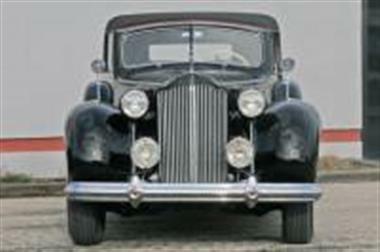 In recent years the owner has used this Victoria as a tour car, for which he describes it as ideal. 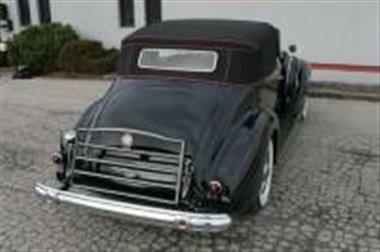 Finished in gleaming black paint, it has a fine red leather interior, banjo steering wheel and grey dash that was only used for the 1938 model year.<br /><br />The black canvas top has red piping, and the car carries twin side-mounts with mirrors, twin spotlights and a rear trunk rack. The chrome and paint are excellent, and overall this five-passenger Victoria may be described as a superior motor car, reported to be in sound mechanical condition .